This is the dream car of any wife! It would be great and the kids would think that you were the coolest mom around. All the other kids in the neighborhood would want you to drive and your kids would be popular because of it. Hello Kitty has a way of doing that. And how selfish can you really be? Not wanting to have kids with your wife just because of a car? It shows how shallow and uncaring you really are and gives us another reason to know not to take anything you say seriously. I don’t think it’s selfish at all to not have kids because of this car. If my mom had owned this car when I was growing up I would have run away. Any child who arrives at school in this would probably be so ridiculed they would drop out and start a life of crime or drug use. Think of how much better his childrens lives will be sans this car. That’s actually kind of cute. But I’d expect this to belong to a Sanrio employee or an advertisement agency instead of a mother of sane children, no? But wouldn’t you want your kids to be popular for who they are, not for what they have? HMM? I am positive the kid would get bullied so bad if he/she ever arrive school in this. I would tell my mom I could walk to school, never mind it is a 3 hours walk away. 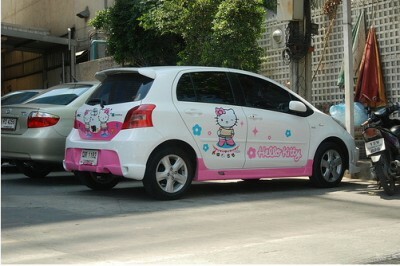 If one is going to have colorful Hello Kitty images on a car, then yeah – it makes sense that the car would be white.